The picture shows the salad undressed as this was made for a picnic and I took the pic at home. Always bring your dressing separately and dress the salad at the last possible moment! Shred the lettuce, roughly chop all the herbs, slice the cucumber and smash the cashew nuts into little bits. Combine everything in a big mixing bowl. Mix well. Scatter sesame seeds on top. 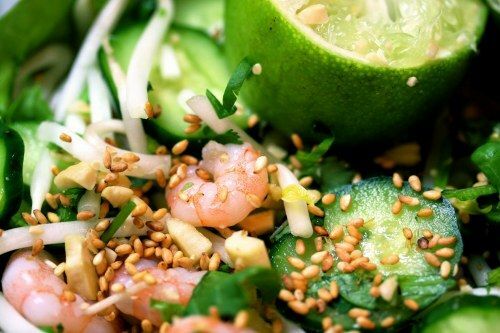 Whisk together a glug of chilli sauce, the juice of one lime (put the lime halves in with the salad after, for garnish), a dash of sesame oil and a little bit of salt. Adjust the levels to your liking. Store dressing in a container until you are ready to serve the salad.